For the second year in a row, the Perry Hall White Marsh Business Association will be doing something special to give back to the community. 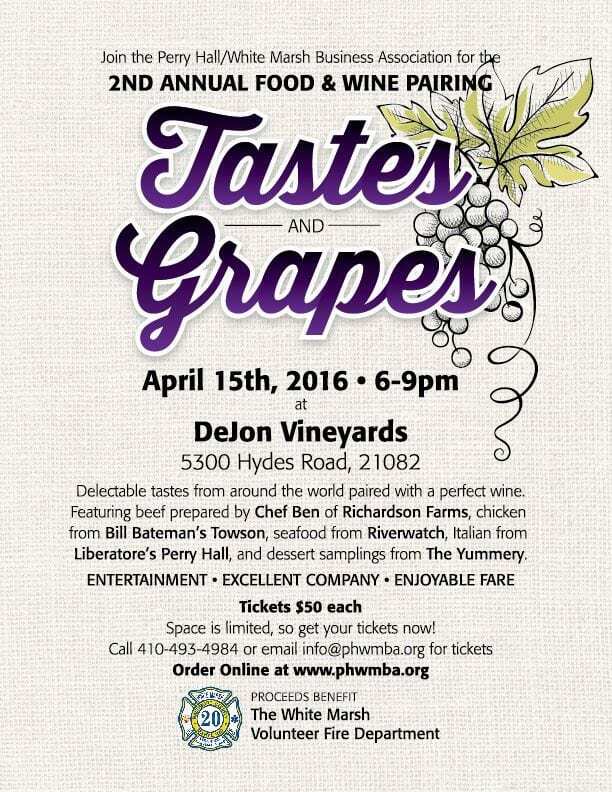 On April 15, 2016, the PHWMBA will host the second annual “Tastes and Grapes” event at Dejon Vineyards, with proceeds going to benefit the White Marsh Volunteer Fire Company‘s Capital Campaign. WMVFC has outgrown its current station, which is location in a flood zone and right next to the train tracks along Ebenezer Road. They are looking to build a new facility near General Motors / Allison Transmission in White Marsh. GM donated land to the station last month. “Tastes and Grapes” will feature beef prepared by Chef Ben from Richardson Farms, chicken from Bill Bateman’s Towson, seafood from Riverwatch, Italian food from Liberatore’s Perry Hall and dessert samplings from The Yummery. Tickets are $50 each and can be ordered by clicking here. You can also contribute directly to the WMVFC Capital Campaign by clicking here.